Includes everything you need to convert from SDI to analog HD/SD component, NTSC and PAL video out, plus balanced AES/EBU and analog audio out. Easily connect to Betacam SP, VHS and analog video monitors. Features hardware down converter to connect HD-SDI video to SD equipment. 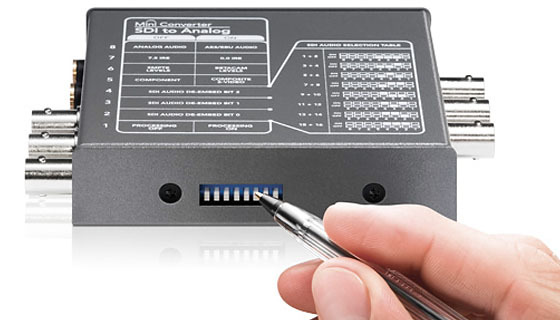 Mini Converters are the world’s most advanced and easy-to-use SDI converters. Built with the highest quality components and connectors, Mini Converters automatically switch between SD, HD, 3G-SDI and 4K models switch up to Ultra HD resolutions with 6G-SDI video standards! Whether you want to convert to or from SDI, move between different SDI video formats or distribute SDI signals to multiple destinations, you get the highest quality broadcast technology in a compact and affordable design. Choose from a range of many different models, all featuring low SDI jitter and SDI re-clocking so you can use the longest SDI cable lengths and maintain pristine quality images. Broadcast, post production and professional A/V environments are built using SDI equipment and cabling. It’s essential when converting to and from SDI that you maintain the highest possible video and audio quality. Mini Converters are compact, affordable and easy-to-use. Settings can be changed quickly using built-in mini switches, and with a diagram showing pin settings printed on the back you never need to refer to a manual! Mini Converters use standard connections, so you get the convenience and cost savings of using your own cables! Mini Converters 4K models feature the latest 6G-SDI technology that operates at four times the data rate of normal HD-SDI. 6G-SDI is fully compatible with all SD-SDI and HD-SDI equipment, so you can connect to your existing equipment. Mini Converters detect the video input and automatically switch between formats.